JG Environmental professional garden clearances. As we are human beings we understand from time to time clutter and belongings that we no longer need can often build up, especially in sheds, gardens and garages. The classic “I will get rid of that later” mentality is present and then as life gets busy or priorities take over the clutter takes a back seat and ends up building up. Truth of the matter is that clutter and garbage building up in the garden can become a health and safety hazard especially when kids are living in the property. On top of this build ups like this can attract animals and rodents to the property adding to the problems as well as creating more mess and additional health risks with pest control charges on top to deal with the pests. 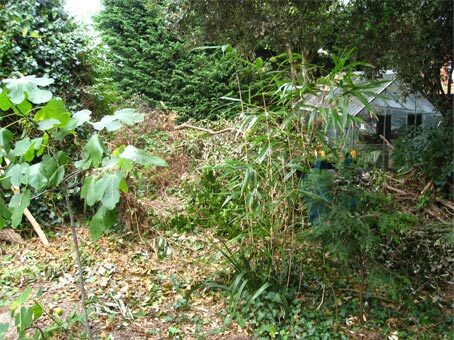 There may be other reasons for needing a garden clearance. For example when looking to sell the house garden waste may be bringing down the price of the property and removing it will get you more for your money. You might simply be renovating the garden and have some unwanted rubbish sitting around that you don’t want to put into the car or you might have just taken apart some no longer needed garden furniture such as benches, pottery, sheds or even greenhouses. No matter what the material or the circumstances we guarantee to get rid of the materials for you. When contacting the sales team it is important to let us know what materials are being cleared as depending on what materials they are depends on how and where they are disposed of. For example garden waste will be disposed of differently compared to rubble. As well as this it is also essential to let us know an estimate of the quantity of the amount of material that is being cleared. This is for us to determine the best method, tools and transport for disposing the materials most efficiently as well as providing you the most accurate quote we can give. The sales team will take this information from you as well as some contact details. Once all necessary information is taken a member of the team will put together a quote and return this to you. Once approved an appointment that is convenient for both parties will be booked in, then on the day our technicians will phone ahead of time so you can be fully prepared for our visit.